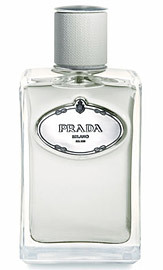 Infusion d’Homme is a part of Prada’s infusions series that includes one of my favorites, Infusion d’Iris. This series of sheer and light fragrances aren’t known much for their longevity or silage but are fantastic as clean and light fragrances. In Bottle: Infusion d’Homme smells fresh and clean, mildly aromatic but mostly just fresh and clean–like a bar of soap. Generic, lovely smelling, soap. Applied: Neroli and dryness for a moment then Infusion d’Homme sends the soap straight out at you. There’s a powderiness to this that lingers a bit with the soap, furthering that clean, fresh scent. Infusion d’Homme does one thing well and that is make you think you’re wearing a bar of soap around your neck. It’s a nice bar of soap though. During the middle development, this gets a little sharper and very, very slightly sweeter before it goes back to just soap. There’s a pyramid of notes presented for Infusion d’Homme that I think is just there for show since the only piece of that pyramid I saw was powder and neroli. The soap stays with you, never truly leaving–not even on the dry down when Infusion d’Homme gets a bit more powdery. Extra: Although generally thought to be a masculine fragrance, Infusion d’Homme is more of a unisex. I don’t really see how a fragrance that smells like soap and cleanliness could have a gender anyway. Design: Call me a sucker for uniform, but I love how these infusions are bottled the same way with varying colors and slightly different themes. Infusion d’Homme is bottled exactly the same way as Infusion d’Iris except it is a beige color instead of a light green. Simple, elegant, looks great on a shelf–if I kept my fragrances on a shelf, anyway. Notes: Mandarin, neroli, clean notes, iris, galbanum, cedar, vetiver, benzoin, frankincense, powdery notes. Infusion d’Homme reminds me a bit of my childhood, French colonial style apartment buildings with clotheslines threading the distance between them. A day on the stone balcony playing with a bar of soap, that this fragrance invokes the smell of, while our downstairs neighbor simultaneously cooked dinner and yelled at her kids. Reviewed in This Post: Infusion d’Homme, 2009, Eau de Toilette. This entry was posted in fresh, prada, Reviews By House and tagged blog, clean, dhomme, fragrance, fresh, homme, infusion, perfume, prada, review, scent, soap. Bookmark the permalink.